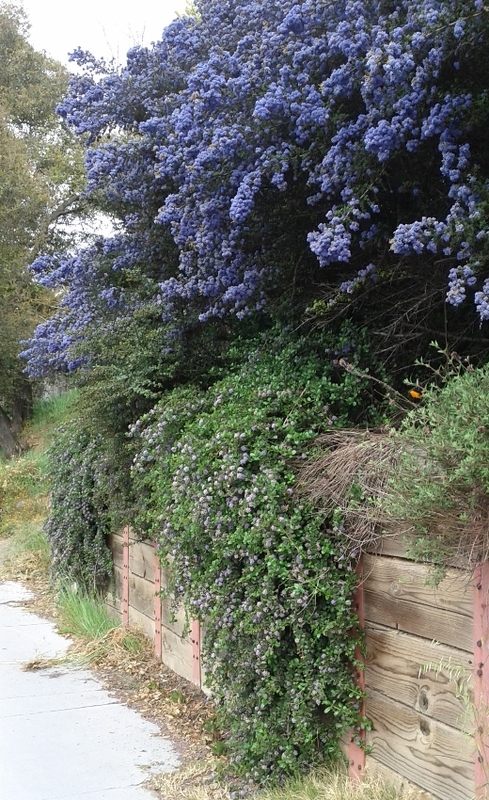 The Planting Guide application will suggest which California native plants will likely grow well at a particular location. If you are having any trouble using this application, please contact Calflora support. Click on the scientific name of a plant to see more information about that plant. If you want to qualify what plants are returned, use the criteria in the upper left. By default, low water is checked, and the application will look for plants that tolerate low water conditions. As an alternative, check riparian to find plants that typically need more water (for instance, plants that would grow on the bank of a seasonal creek). Or uncheck them both. If the planting site is under shade, check shade. The butterfly icon appears next to plants known to be particularly attractive to beneficial insects. If you are not seeing enough plants in the results, open More Criteria and uncheck omit plants at the edge of their tolerances. Each plant has a set of elevation, climate and soil tolerances associated with it. For instance, Vaccinium ovatum, huckleberry, tolerates a range of Annual Precipitation from 19 to 117 inches. Normally, the application will include a plant in the results only if, for each factor, the location value is somewhere in the middle of the plant's range. If you uncheck this flag, the application will include plants if the location value is anywhere inside the plant's range, including the extreme low and the extreme high. If you are still not seeing enough plants, uncheck both in the same county and within 10 miles. Without these constraints, the application may return some plants that do not grow locally, but otherwise meet elevation, climate and soil conditions. If very few plants are returned in the results, it may be because the soil at that location has some extreme condition, such as high salinity, or very high or very low pH. To find out what factor might be responsible, open LAYERS (upper right), open Soil, and then select either pH or Salinity. 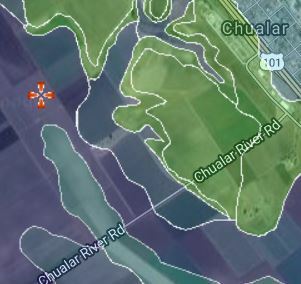 If you are zoomed close enough, the map will display colored polygons indicating the soil factor at the chosen location and in the nearby area. If your planting site has an extreme soil condition, but you are planning some treatment for the soil to offset that condition, you can find out what plants are appropriate for the site without taking soil factors into account. Open More Criteria and uncheck use soil factors to choose plants. To see fewer results, open More Criteria and check easy to establish. With this constraint on, the application will only return plants that are commonly used in native plant gardens and easy to grow. Or, check within 10 miles. With this constraint on, the application will only return a plant if there is a recorded wild occurrence within 10 miles of the planting site. Soil data are not available for the whole state. If you choose a location for which soil data is not available, you will see a warning, and the plants you see in the results will have been selected only on the basis of the other factors (elevation, county, and climate). Climate data and County data are not available for areas outside of California. If you choose a location outside of California you will see a warning, and the plants you see in the results will have been selected only on the basis of elevation. An area with a pH of 7.9 (purple), close to an area with a pH of 5.6 (green). When you click on the scientific name of a plant, a menu opens with the following links. Calflora Taxon Report: From the Taxon Report page, you can find out more about the plant. Follow additional links for information about plant characteristics, distribution, observations, etc. CNPLX: Information about which nurseries may sell the plant. 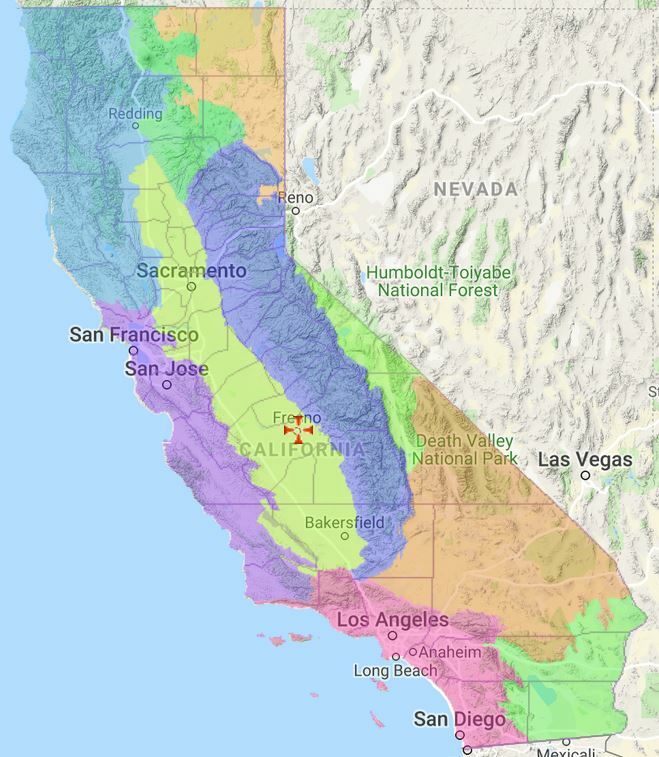 Location Suitability: This Calflora application will show specifically how well the plant's tolerances fit with elevation, soil and climate values of the planting site. It is also an easy way to see if there are any wild populations of this plant nearby. Only plants that have been observed growing wild in the same county as the chosen location will be shown. Only plants that have been observed growing wild within 10 miles of the chosen location will be shown. NRCS SSURGO soil data is available for most of California. If this box is checked, and if soil data is available for the chosen location, only plants that tolerate the soil conditions at that location will be shown. Check this box to limit the number of results; uncheck it to get more results. If this box is checked, a plant will be shown only if the climate and soil factors of the chosen location are well within the tolerances of the plant. Only plants that are know to be easy to establish are shown. Information about ease of establishment is courtesy of NRCS California. If you want to limit the results to plants that are known to grow with an existing plant at the chosen location, enter the name of the existing plant. Scientific Name and Common Name are typeahead enabled. For instance, if there is a Buckeye tree growing your yard, and you want to make sure you introduce plants that typically grow with Buckeye in the area, then enter Buckeye here. There is a link to the Planting Guide from each Calflora Taxon Report page (lower right, just below Location Suitability). Click on this link, and then choose a location to see what plants typically grow with the plant in that area. There is a similar feature available on CNPLX For example, here are plants that grow with Sambucus nigra in the Central Western California Jepson Region. Press TOOLS to open the tools menu. link, and the current plant list will be sent to you as an email. (This feature is only available if you are signed into Calflora.) Once you have the list as an email, you can print it or forward it to a native plant nursery. link, and a spreadsheet containing the current plant list will be generated, Your browser will be redirected to the spreadsheet. (This feature is only available if you are signed into Calflora.) This spreadsheet may be a good way to request availability information from native plant nuseries. To use it for this purpose, edit the spreadsheet, and delete the plants you are not interested in. The spreadsheet has a Quantity column and a Price column. If you are interested in plants usually sold as seed (Annuals, Grasses, sometimes Perennials), and are intending to send the sheet to a seed vandor, fill in the Quantity column with the number of pounds of seed that you want. If you are interested in plants sold in containers, fill in the Quantity column with the number of plants that you want, and the size of the container. For instance, "4 X 1 gallon". Some seed vendors and native plant nurseries are accustomed to receiving requests for prices in this way. When they receive your spreadsheet, they will fill in the price for those plants they are able to sell, and return it to you. link to see which wild plants have been observed in the area. When the What Grows Here? search first comes up, it is showing commercially available native plants observed in the map area zoomed fairly close (zoom level 13). Zoom out to find more plants. If you are interested in native plants in the area which are not commercially available, uncheck commercially available. Design Approach. There are lots of great native plants, but they are not all available commercially, and they are not all going to grow well at a particular planting site. This application is designed following a kind of less-is-more philosophy, in that it tries to limit the number of suggested plants as much as possible. To find matching plants, the application matches plant tolerances with location values of the following nineteen factors. The plant has been observed growing wild in the county. Plant Materials: The native species suggested by this application are available from vendors either as seed or in containers. Annual Herbs and Grasses are typically available as seed. Look for seed vendors as a source for these species. Shrubs, Trees, Vines and Ferns are typically available in containers. Look for native plant nurseries as a source for these species. Perennial Herbs are sometimes available as seed and sometimes in containers. A perennial already growing in a container will usually be easier to establish. Q: What is the difference between the Planting Guide application and the What Grows Here? (WGH) application? A: What Grows Here? reports all wild plant observations in a specified area. The results are sensitive to area, in that the bigger the area you specify, the more results you will see. Also, WGH does not consider where plants could grow based on environmental factors; it only reports plants that have been observed growing. The Planting Guide application, on the other hand, looks at what plants could grow at a single point location. To do this, it matches environmental factors of the point location with the known tolerances of various native plants. Q: According to the map, my planting site has a pH of 8.0, which seems to drastically limit the number of suggested plants. This is my yard, and I am planning on putting down a truckload of purchased soil (presumably with a pH close to neutral, 7.0) before planting, so the pH of the underlying soil is not that much of a factor in choosing plants. Can I get the Planting Guide to recommend plants just based on elevation and climate, and not based on soil? A: Open More Criteria and uncheck use soil factors to choose plants. Q: I am not seeing some common plants in the results that I expect to see. Can I do something so that it returns more common plants? A: To see *ALL* plants that tolerate the conditions at your location, open More Criteria and uncheck omit plants at the edge of their tolerances. You should see a lot more plants in the results. The data upon which the Planting Guide is based was developed with the support and technical assistance of NRCS California. The NRCS eVegGuide application uses a very similar method of plant selection. 2017 March In version 0.73, TOOLS includes an spreadsheet link. Press this link to get the current plant list as a Excel spreadsheet. Also, in More Criteria, there is a new easy to establish checkbox. With this constraint on, the application will only return plants that are commonly used in native plant gardens and easy to grow. 2017 January In version 0.64, TOOLS includes an email link. Press this link to send the current plant list to yourself as an email. 2016 November 30 In version 0.59, when you click on the name of a plant, a menu opens with several links for more information about that plant. 2016 November 15 In version 0.56, added More Criteria to fine tune the plant selection algorithm. 2016 October 30 In version 0.52, subspecies and varieties are removed from the results if the parent plant is also in the results. 2016 October 27 Version 0.50 released.